This book covers the basics of how web APIs work, how to interact with them, and what to think about when building your own. 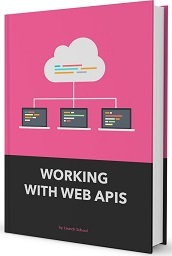 After reading this book and finishing its associated course, you will be able to work with web APIs in your own projects and even build your own APIs. In this era of cloud computing, every data provisioning solution is built in a scalable and fail-safe way. You'll learn best practices for designing APIs that developers will love, and discover how to evolve your APIs as your product grows. Chris Lee has over 16 years of software engineering, consulting, and various leadership experience. His work experience has ranged from Fortune 100 companies to startups and small businesses. When he's not programming, he enjoys playing basketball and spending time with his wife and poodle. Besides crafting elegant software, Kevin Wang has a passion in teaching and education, with extensive experience in building online training programs.